This is just made of jet-black Cool. 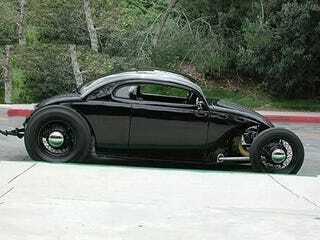 Gorgeous chopped VW Beetle hot rod. I hope it has a Porsche flat-6 in it, even just a small, basic one. Even if not for the power, but just for the sweet 6-cylinder boxer song that would compliment this car so well.